A record 12.3 lakh RTI applications were filed in 2017-18 with 96 per cent of them being responded to by government offices, making it the best performing year since the law was enacted in 2005, the Central Information Commission data shows. The data from the latest CIC annual report, shared by the Ministry of Personnel, Public Grievances and Pensions Thursday, shows that during 2017-18, 12.33 lakh RTI applications were received by the registered Central Public Authorities (PAs). "This is higher by 3,17,458 or 26 per cent than what was reported during 2016-17. 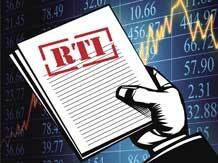 The Central PAs rejected 4 per cent (63,206) of the RTI applications processed during 2017-18 showing a downward trend in rejections which have come down by 2.59 per cent from the 6.59 per cent reported in 2016-17," it said. The four per cent rejection rate is the lowest since 2005 when the RTI Act was enacted by Parliament giving people the right get information from government offices on a payment of Rs 10. Union Home and Finance ministries which commonly get queries on burning topics like black money, demonetisation, big loan defaulters, security issues, policies and other routine administrative matters, led the list of public authorities in terms of rejection rate. The Home Ministry rejected 8,784 applications which is 15.16 per cent of total 57,951 received by it while the Finance Ministry rejected 28,145 applications, which is 14.08 per cent of total 1,99,923 RTI applications received by it, the data showed. The public authorities used exemptions provided under section 8, section 9, section 11 and section 24 of the RTI Act to reject plea for information. Thirty-two per cent of applications were rejected citing other reasons. Section 8 lists nine subsections covering issues such as national security, commercial confidence, parliamentary privilege, cabinet papers, personal information among others under which information can be denied to a person. Section 9 pertains to information related to infringement of copyright, section 11 deals with third party information and section 24 is related to security and intelligence organisations exempted from the RTI Act. The year proved successful to the efforts of the Central Information Commission that all public authorities file their annual returns with it which is mandatory under the RTI Act. On this front, 100 per cent compliance was witnessed during 2017-18 which is a first since enactment of the transparency law, the data showed.